Recharge and get ready for anything. Journey to a private island paradise where wellness is at the core of the experience. 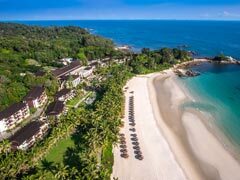 Club Med Bintan Island will tailor family or couples’ getaways to elevate fitness routines, offer healthful dining options, and a wealth of fun activities and sports to reinvigorate the body and relax the mind. Embark on a holistic wellness escape and a journey towards complete revitalisation. Dive into a holistic wellness experience and embark on an adventure for the whole family at the award-winning Club Med Bintan Island. With a variety of fitness activities, outdoor pursuits, and healthy cuisines, return home recharged and rejuvenated. 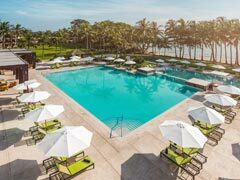 Play 18 holes at the renowned Ria Bintan golf course nearby, push your limits even further with CrossFit, or simply relax with yoga by the beach followed by a fresh, slow-pressed juice. Take a dip in the beachside swimming pool, which spans across two levels, and enjoy calming views the South China Sea. Getting here is easy: Just take the Bintan ferry from Singapore and in under an hour you’ll be diving into a thrilling journey to recharge all the senses. Enjoy an island getaway where energising activities and wellness pursuits are at the centre of the experience. Club Med Bintan Island welcomes you to discover your best self with a variety of culinary experiences and outdoor pursuits for every passion. Elevate your journey with these five distinct experiences to enjoy during your stay. 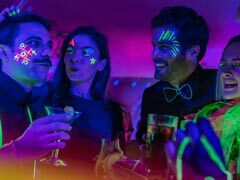 Included: Drinks served by the glass and at the bar only: water, fruit juices and sodas, hot drinks and cocktails with and without alcohol, wines and local and international spirits. A selection of sweet and savoury snacks.In line with Indonesia local law, Club Med is only allowed to serve alcoholic drinks to our guests above 21 years old. With Supplement: Champagnes, VSOP and XO spirits, bottled and canned drinks are available from vending machines in some of our resorts and/or at the Club Med Boutique. Certain super-premium brands and bottled wines are also available à la carte in some of our restaurants and bars. Take it easy in tropical perfection. Settle into the modern, cosy poolside lounge and grab a sip a refreshing drink from The Santaï Bar. This is where everyone meets throughout the day, from morning coffee to refreshments at night. Head over to the centre of the resort where bartenders will mix up something spectacular for you to enjoy. When the sun goes down, the music turns up at The Bagus Bar. Dance, sip cocktails, and enjoy night parties or after-dinner shows where the fun never stops. Celebrate in style. 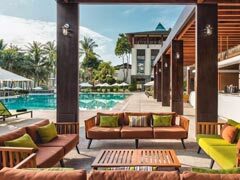 Take in endless views of the South China Sea and swimming pool, and reconnect during family holidays in Bintan on the Panorama Bar terrace. Enjoy a glass of wine, beer, juice, coffee, or a specially mixed drink from this chic, sophisticated escape above it all. Refresh and recharge. 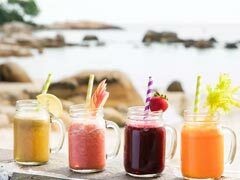 Enjoy sea breezes and your feet in the sand while sampling one of our fresh slow-pressed juices after your morning activities, and reenergise for whatever adventures may come. Whether spending your days playing beach volleyball, tennis, golf, or taking part in the flying trapeze, cool off with a refreshing beverage at the beachside Matahari Bar. 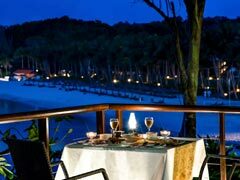 From your first bite in the morning, to your last taste of dessert after sunset, Club Med Bintan Island all-inclusive resort offers a selection of delicious, healthful dining options to satisfy every palate day and night. Savour a selection of hearty or healthy foods from The Waterfall buffet restaurant while you take in stunning sea views through grand-scale windows. 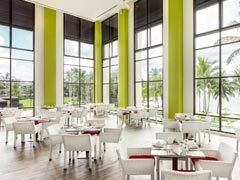 Located above the swimming pool, the restaurant offers you a myriad of local specialties and international dishes, including Japanese, Indian, Korean, Italian, American , and French cuisine, as well as low-calorie dishes from the Healthy Corner. For added convenience, a Baby Corner will offer a place to prepare special meals, and a variety of amenities to make dining with a young one relaxing. Please note: Tables seat 2 to 8 people. High chairs are available upon request. Enjoy a romantic dinner for two. For the most scenic locale in which to enjoy an intimate dining experience, The Terrasse sprawls out onto a breezy outdoor sitting area where South China Sea views are awe-inspiring. Whether for a savoury late breakfast, a late lunch after 18 holes on the nearby golf course, or reservations-only dining on select evenings, you’ll enjoy an unforgettable meal. Please note: Tables seat 2 to 8 people. High chairs and booster seats are available upon request. 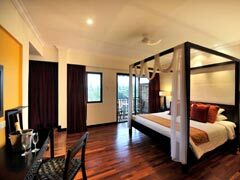 Wind down in any of our Bintan resort’s thoughtfully-appointed 311 rooms and suites. Welcome to relaxing havens after active days where local architectural elements using local woodcraft blend harmoniously with the natural landscape. Rest easy. Perfect for couples or small families with a young child, our Club Rooms span a comfortable 34 to 39 square metres. Step out on a private balcony with sea or lush landscape views and take in the fresh sea breeze day and night. 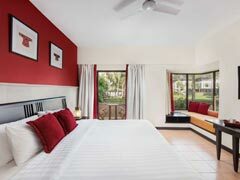 Crisp white linens, a spacious desk, and pops of warm reds make this a cosy atmosphere in which to conclude the day in Bintan. Elevate your stay. The Deluxe Rooms, which span 34 to 41 square metres, are awash with natural daylight through expansive windows. 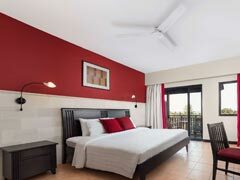 Get rest on crisp white bed linens, or enjoy a cup of tea on the private terrace or balcony under a shady umbrella. This is where family holidays in Bintan begin each morning and conclude at night. Make your stay even more memorable. For a romantic getaway or a spacious retreat for families, the Oceanview Suites are a premium address. Spanning approximately 80 square metres, our Bintan Island suites also features private patio with lounge seating and a smaller terrace off of the master bedroom. Step outside for and take in unobstructed views. The master bathroom boasts a double vanity, separate WC, soaking tub, and glass-wrapped shower for spa-like comforts. An expansive living room offers comfortable seating, a dinette table for two, and a TV for entertainment, while a four-poster bed with fresh white linens welcomes night of peaceful sleep. Let us take care of you: Enjoy room service for breakfast each morning and turndown service in the evening. Your kids deserve the best time ever. Discover our variety of fun activities and clubs for children and teens that will make their getaway unforgettable. Drawing from over 40 years of Club Med experience with children’s programs and with dedicated spaces designed with their needs in mind, parents can enjoy their holiday away knowing their young ones are in good hands. 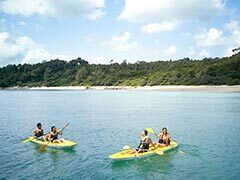 From flying high on a circus trapeze, to outdoor sports and games and creative activities for all ages, your kids will love their family holidays in Bintan Island. Age-specific clubs: Petit Club Med (2 to 3 years) (Extra Charge), Mini Club Med (4 to 10) (Included), Junior Club Med (11 to 17 years) (Included). Hotel amenities and facilities for kids: BABYSITTING From 4 months to 7 years (extra charge), CLUB MED BABY WELCOME® (FROM BIRTH TO 23 MONTHS) Until 23 months, BABY CORNER From 4 to 23 months. Activities for kids: PETIT CHEF PROGRAM From 4 to 10 years, LITTLE CIRCUS From 4 to 5 years, TEEN SPA From 11 to 17 years (extra charge). Activities Sports Schools Included: Archery School, Flying Trapeze School with circus activities, Fitness School, Golf School, Windsurfing School, Sailing School. Activities Sports Included: Badminton, Basketball, Beach volleyball, Football, Snorkelling (Summer only), Squash, Volleyball, Yoga, Waterpolo, Aquafitness, Tennis, Cardio and weights room, Kayaking, Stand_Up_Paddle. Activities Sports extra charge: Golf (green fees) & Surfing.